Not to be confused with Lightning. "Artificial light" redirects here. For the song, see Artificial Light (song). For simulated 3D lighting, see Computer graphics lighting. Indoor lighting is usually accomplished using light fixtures, and is a key part of interior design. Lighting can also be an intrinsic component of landscape projects. With the discovery of fire, the earliest form of artificial lighting used to illuminate an area were campfires or torches. As early as 400,000 BCE, fire was kindled in the caves of Peking Man. Prehistoric people used primitive oil lamps to illuminate surroundings. These lamps were made from naturally occurring materials such as rocks, shells, horns and stones, were filled with grease, and had a fiber wick. Lamps typically used animal or vegetable fats as fuel. Hundreds of these lamps (hollow worked stones) have been found in the Lascaux caves in modern-day France, dating to about 15,000 years ago. Oily animals (birds and fish) were also used as lamps after being threaded with a wick. Fireflies have been used as lighting sources. Candles and glass and pottery lamps were also invented. Chandeliers were an early form of "light fixture". A major reduction in the cost of lighting occurred with the discovery of whale oil. The use of whale oil declined after Abraham Gesner, a Canadian geologist, first refined kerosene in the 1840s, allowing brighter light to be produced at substantially lower cost. In the 1850s, the price of whale oil dramatically increased (more than doubling from 1848 to 1856) due to shortages of available whales, hastening whale oil's decline. By 1860, there were 33 kerosene plants in the United States, and Americans spent more on gas and kerosene than on whale oil. The final death knell for whale oil was in 1859, when crude oil was discovered and the petroleum industry arose. Gas lighting was economical enough to power street lights in major cities starting in the early 1800s, and was also used in some commercial buildings and in the homes of wealthy people. The gas mantle boosted the luminosity of utility lighting and of kerosene lanterns. The next major drop in price came about in the 1880s with the introduction of electric lighting in the form of arc lights for large space and street lighting followed on by incandescent light bulb based utilities for indoor and outdoor lighting. Over time, electric lighting became ubiquitous in developed countries. Segmented sleep patterns disappeared, improved nighttime lighting made more activities possible at night, and more street lights reduced urban crime. An important property of light fixtures is the luminous efficacy or wall-plug efficiency, meaning the amount of usable light emanating from the fixture per used energy, usually measured in lumen per watt. A fixture using replaceable light sources can also have its efficiency quoted as the percentage of light passed from the "bulb" to the surroundings. The more transparent the lighting fixture is, the higher efficacy. Shading the light will normally decrease efficacy but increase the directionality and the visual comfort probability. Task lighting is mainly functional and is usually the most concentrated, for purposes such as reading or inspection of materials. For example, reading poor-quality reproductions may require task lighting levels up to 1500 lux (150 footcandles), and some inspection tasks or surgical procedures require even higher levels. General lighting (sometimes referred to as ambient light) fills in between the two and is intended for general illumination of an area. Indoors, this would be a basic lamp on a table or floor, or a fixture on the ceiling. Outdoors, general lighting for a parking lot may be as low as 10-20 lux (1-2 footcandles) since pedestrians and motorists already used to the dark will need little light for crossing the area. Front lighting is also quite common, but tends to make the subject look flat as its casts almost no visible shadows. Lighting from the side is the less common, as it tends to produce glare near eye level. Backlighting either around or through an object is mainly for accent. Backlighting either around or through an object is mainly for accent. Backlighting is used to illuminate a background or backdrop. This adds depth to an image or scene. Others use it to achieve a more dramatic effect. Forms of lighting include alcove lighting, which like most other uplighting is indirect. This is often done with fluorescent lighting (first available at the 1939 World's Fair) or rope light, occasionally with neon lighting, and recently with LED strip lighting. It is a form of backlighting. Recessed lighting (often called "pot lights" in Canada, "can lights" or 'high hats" in the US) is popular, with fixtures mounted into the ceiling structure so as to appear flush with it. These downlights can use narrow beam spotlights, or wider-angle floodlights, both of which are bulbs having their own reflectors. There are also downlights with internal reflectors designed to accept common 'A' lamps (light bulbs) which are generally less costly than reflector lamps. Downlights can be incandescent, fluorescent, HID (high intensity discharge) or LED. Track lighting, invented by Lightolier, was popular at one period of time because it was much easier to install than recessed lighting, and individual fixtures are decorative and can be easily aimed at a wall. It has regained some popularity recently in low-voltage tracks, which often look nothing like their predecessors because they do not have the safety issues that line-voltage systems have, and are therefore less bulky and more ornamental in themselves. A master transformer feeds all of the fixtures on the track or rod with 12 or 24 volts, instead of each light fixture having its own line-to-low voltage transformer. There are traditional spots and floods, as well as other small hanging fixtures. A modified version of this is cable lighting, where lights are hung from or clipped to bare metal cables under tension. Animated fountain in Moscow's Square of Europe, lit at night. High mast lighting along Highway 401 in Ontario, Canada. Street Lights are used to light roadways and walkways at night. Some manufacturers are designing LED and photovoltaic luminaires to provide an energy-efficient alternative to traditional street light fixtures. Floodlights are used to illuminate outdoor playing fields or work zones during nighttime. Floodlights can be used to illuminate work zones or outdoor playing fields during nighttime hours. The most common type of floodlights are metal halide and high pressure sodium lights. Beacon lights are positioned at the intersection of two roads to aid in navigation. Sometimes security lighting can be used along roadways in urban areas, or behind homes or commercial facilities. These are extremely bright lights used to deter crime. Security lights may include floodlights. Entry lights can be used outside to illuminate and signal the entrance to a property. These lights are installed for safety, security, and for decoration. Underwater accent lighting is also used for koi ponds, fountains, swimming pools and the like. Vehicles typically include headlamps and tail lights. Headlamps are white or selective yellow lights placed in the front of the vehicle, designed to illuminate the upcoming road and to make the vehicle more visible. Many manufactures are turning to LED headlights as an energy-efficient alternative to traditional headlamps. Tail and brake lights are red and emit light to the rear so as to reveal the vehicle's direction of travel to following drivers. White rear-facing reversing lamps indicate that the vehicle's transmission has been placed in the reverse gear, warning anyone behind the vehicle that it is moving backwards, or about to do so. Flashing turn signals on the front, side, and rear of the vehicle indicate an intended change of position or direction. In the late 1950s, some automakers began to use electroluminescent technology to backlight their cars' speedometers and other gauges or to draw attention to logos or other decorative elements. Commonly called 'light bulbs', lamps are the removable and replaceable part of a light fixture, which converts electrical energy into electromagnetic radiation. While lamps have traditionally been rated and marketed primarily in terms of their power consumption, expressed in watts, proliferation of lighting technology beyond the incandescent light bulb has eliminated the correspondence of wattage to the amount of light produced. For example, a 60 W incandescent light bulb produces about the same amount of light as a 13 W compact fluorescent lamp. Each of these technologies has a different efficacy in converting electrical energy to visible light. Visible light output is typically measured in lumens. This unit only quantifies the visible radiation, and excludes invisible infrared and ultraviolet light. A wax candle produces on the close order of 13 lumens, a 60 watt incandescent lamp makes around 700 lumens, and a 15-watt compact fluorescent lamp produces about 800 lumens, but actual output varies by specific design. Rating and marketing emphasis is shifting away from wattage and towards lumen output, to give the purchaser a directly applicable basis upon which to select a lamp. Ballast: A ballast is an auxiliary piece of equipment designed to start and properly control the flow of power to discharge light sources such as fluorescent and high intensity discharge (HID) lamps. Some lamps require the ballast to have thermal protection. fluorescent light: A tube coated with phosphor containing low pressure mercury vapor that produces white light. Halogen: Incandescent lamps containing halogen gases such as iodine or bromine, increasing the efficacy of the lamp versus a plain incandescent lamp. Neon: A low pressure gas contained within a glass tube; the color emitted depends on the gas. Compact fluorescent lamps: CFLs are designed to replace incandescent lamps in existing and new installations. 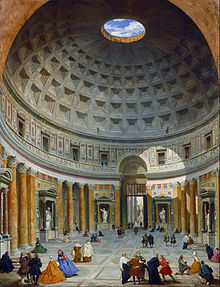 Lighting without windows: The Pantheon in the 18th century, painted by Giovanni Paolo Panini. Lighting design as it applies to the built environment is known as 'architectural lighting design'. Lighting of structures considers aesthetic elements as well as practical considerations of quantity of light required, occupants of the structure, energy efficiency, and cost. Artificial lighting takes into account the amount of daylight received in a space by using daylight factor calculations. For simple installations, hand calculations based on tabular data are used to provide an acceptable lighting design. More critical or complex designs now routinely use computer software such as Radiance for mathematical modeling, which can allow an architect to quickly evaluate the benefit of a proposed design. Photometric studies (also sometimes referred to as "layouts" or "point by points") are often used to simulate lighting designs for projects before they are built or renovated. This enables architects, designers, and engineers to determine which configuration of lighting fixtures will deliver the amount of light needed. Other parameters that can be determined are the contrast ratio between light and dark areas. In many cases these studies are referenced against IESNA or CIBSE recommended practices for the type of application. Depending on the building type, client, or safety requirements, different design aspects may be emphasized for safety or practicality. Specialized software is often used to create these, which typically combine the use of two-dimensional CAD drawings and lighting calculation software (i.e. AGi32, Visual, Dialux). Moving heads in a photo studio set. Illuminating subject from beneath to achieve a heightened dramatic effect. Lighting illuminates the performers and artists in a live theatre, dance, or musical performance, and is selected and arranged to create dramatic effects. Stage lighting uses general illumination technology in devices configured for easy adjustment of their output characteristics. The setup of stage lighting is tailored for each scene of each production. Dimmers, colored filters, reflectors, lenses, motorized or manually aimed lamps, and different kinds of flood and spot lights are among the tools used by a stage lighting designer to produce the desired effects. A set of lighting cues are prepared so that the lighting operator can control the lights in step with the performance; complex theatre lighting systems use computer control of lighting instruments. Measurement of light or photometry is generally concerned with the amount of useful light falling on a surface and the amount of light emerging from a lamp or other source, along with the colors that can be rendered by this light. The human eye responds differently to light from different parts of the visible spectrum, therefore photometric measurements must take the luminosity function into account when measuring the amount of useful light. The basic SI unit of measurement is the candela (cd), which describes the luminous intensity, all other photometric units are derived from the candela. Luminance for instance is a measure of the density of luminous intensity in a given direction. It describes the amount of light that passes through or is emitted from a particular area, and falls within a given solid angle. The SI unit for luminance is candela per square metre (cd/m2). The CGS unit of luminance is the stilb, which is equal to one candela per square centimetre or 10 kcd/m2. The amount of useful light emitted from a source or the luminous flux is measured in lumen (lm). The SI unit of illuminance and luminous emittance, being the luminous power per area, is measured in Lux. It is used in photometry as a measure of the intensity, as perceived by the human eye, of light that hits or passes through a surface. It is analogous to the radiometric unit watts per square metre, but with the power at each wavelength weighted according to the luminosity function, a standardized model of human visual brightness perception. In English, "lux" is used in both singular and plural. Several measurement methods have been developed to control glare resulting from indoor lighting design. The Unified Glare Rating (UGR), the Visual Comfort Probability, and the Daylight Glare Index are some of the most well-known methods of measurement. In addition to these new methods, four main factors influence the degree of discomfort glare; the luminance of the glare source, the solid angle of the glare source, the background luminance, and the position of the glare source in the field of view must all be taken into account. For example, in order to meet the expectations for good color rendering in retail applications, research suggests using the well-established CRI along with another metric called gamut area index (GAI). GAI represents the relative separation of object colors illuminated by a light source; the greater the GAI, the greater the apparent saturation or vividness of the object colors. As a result, light sources which balance both CRI and GAI are generally preferred over ones that have only high CRI or only high GAI. The small, head-mounted device measures an individual's daily rest and activity patterns, as well as exposure to short-wavelength light that stimulates the circadian system. The device measures activity and light together at regular time intervals and electronically stores and logs its operating temperature. The Daysimeter can gather data for up to 30 days for analysis. Selection of fixture and lamp types that reflect best available technology for energy conservation. In countries where indoor lighting of simple dwellings is a significant cost, "Moser lamps", plastic water-filled transparent drink bottles fitted through the roof, provide the equivalent of a 40- to 60-watt incandescent bulb each during daylight. Load shedding can help reduce the power requested by individuals to the main power supply. Load shedding can be done on an individual level, at a building level, or even at a regional level. Specification of illumination requirements is the basic concept of deciding how much illumination is required for a given task. Clearly, much less light is required to illuminate a hallway compared to that needed for a word processing work station. Generally speaking, the energy expended is proportional to the design illumination level. For example, a lighting level of 400 lux might be chosen for a work environment involving meeting rooms and conferences, whereas a level of 80 lux could be selected for building hallways. If the hallway standard simply emulates the conference room needs, then much more energy will be consumed than is needed. Unfortunately, most of the lighting standards even today have been specified by industrial groups who manufacture and sell lighting, so that a historical commercial bias exists in designing most building lighting, especially for office and industrial settings. Lighting control systems reduce energy usage and cost by helping to provide light only when and where it is needed. Lighting control systems typically incorporate the use of time schedules, occupancy control, and photocell control (i.e.daylight harvesting). Some systems also support demand response and will automatically dim or turn off lights to take advantage of utility incentives. Lighting control systems are sometimes incorporated into larger building automation systems. Many newer control systems are using wireless mesh open standards (such as ZigBee), which provides benefits including easier installation (no need to run control wires) and interoperability with other standards-based building control systems (e.g. security). In response to daylighting technology, daylight harvesting systems have been developed to further reduce energy consumption. These technologies are helpful, but they do have their downfalls. Many times, rapid and frequent switching of the lights on and off can occur, particularly during unstable weather conditions or when daylight levels are changing around the switching illuminance. Not only does this disturb occupants, it can also reduce lamp life. A variation of this technology is the 'differential switching or dead-band' photoelectric control which has multiple illuminances it switches from so as not to disturb occupants as much. Occupancy sensors to allow operation for whenever someone is within the area being scanned can control lighting. When motion can no longer be detected, the lights shut off. Passive infrared sensors react to changes in heat, such as the pattern created by a moving person. The control must have an unobstructed view of the building area being scanned. Doors, partitions, stairways, etc. will block motion detection and reduce its effectiveness. The best applications for passive infrared occupancy sensors are open spaces with a clear view of the area being scanned. Ultrasonic sensors transmit sound above the range of human hearing and monitor the time it takes for the sound waves to return. A break in the pattern caused by any motion in the area triggers the control. Ultrasonic sensors can see around obstructions and are best for areas with cabinets and shelving, restrooms, and open areas requiring 360-degree coverage. Some occupancy sensors utilize both passive infrared and ultrasonic technology, but are usually more expensive. They can be used to control one lamp, one fixture or many fixtures. Daylighting is the oldest method of interior lighting. Daylighting is simply designing a space to use as much natural light as possible. This decreases energy consumption and costs, and requires less heating and cooling from the building. Daylighting has also been proven to have positive effects on patients in hospitals as well as work and school performance. Due to a lack of information that indicate the likely energy savings, daylighting schemes are not yet popular among most buildings. In recent years light emitting diodes (LEDs) are becoming increasingly efficient leading to an extraordinary increase in the use of solid state lighting. In many situations, controlling the light emission of LEDs may be done most effectively by using the principles of nonimaging optics. It is valuable to provide the correct light intensity and color spectrum for each task or environment. Otherwise, energy not only could be wasted but over-illumination can lead to adverse health and psychological effects. Beyond the energy factors being considered, it is important not to over-design illumination, lest adverse health effects such as headache frequency, stress, and increased blood pressure be induced by the higher lighting levels. In addition, glare or excess light can decrease worker efficiency. Analysis of lighting quality particularly emphasizes use of natural lighting, but also considers spectral content if artificial light is to be used. Not only will greater reliance on natural light reduce energy consumption, but will favorably impact human health and performance. New studies have shown that the performance of students is influenced by the time and duration of daylight in their regular schedules. Designing school facilities to incorporate the right types of light at the right time of day for the right duration may improve student performance and well-being. Similarly, designing lighting systems that maximize the right amount of light at the appropriate time of day for the elderly may help relieve symptoms of Alzheimer's Disease. The human circadian system is entrained to a 24-hour light-dark pattern that mimics the earth’s natural light/dark pattern. When those patterns are disrupted, they disrupt the natural circadian cycle. Circadian disruption may lead to numerous health problems including breast cancer, seasonal affective disorder, delayed sleep phase syndrome, and other ailments. A study conducted in 1972 and 1981, documented by Robert Ulrich, surveyed 23 surgical patients assigned to rooms looking out on a natural scene. The study concluded that patients assigned to rooms with windows allowing lots of natural light had shorter postoperative hospital stays, received fewer negative evaluative comments in nurses’ notes, and took fewer potent analegesics than 23 matched patients in similar rooms with windows facing a brick wall. This study suggests that due to the nature of the scenery and daylight exposure was indeed healthier for patients as opposed to those exposed to little light from the brick wall. In addition to increased work performance, proper usage of windows and daylighting crosses the boundaries between pure aesthetics and overall health. Compact fluorescent lamps (CFLs) use less power than an incandescent lamp to supply the same amount of light, however they contain mercury which is a disposal hazard. Due to the ability to reduce electricity consumption, many organizations encourage the adoption of CFLs. Some electric utilities and local governments have subsidized CFLs or provided them free to customers as a means of reducing electricity demand. For a given light output, CFLs use between one fifth and one quarter the power of an equivalent incandescent lamp. Unlike incandescent lamps CFLs need a little time to warm up and reach full brightness. Not all CFLs are suitable for dimming. LED lamps have been advocated as the newest and best environmental lighting method. According to the Energy Saving Trust, LED lamps use only 10% power compared to a standard incandescent bulb, where compact fluorescent lamps use 20% and energy saving halogen lamps 70%. The lifetime is also much longer — up to 50,000 hours. A downside is still the initial cost, which is higher than that of compact fluorescent lamps. Recent findings about the increased use of blue-white LEDs may be a policy mistake. The wide-scale adoption of LEDs will reap energy savings but the energy savings may be compromising human health and ecosystems. The American Medical Association warned on the use of high blue content white LEDs in street lighting, due to their higher impact on human health and environment, compared to low blue content light sources (e.g. High Pressure Sodium, PC amber LEDs, and low CCT LEDs). Light pollution is a growing problem in reaction to excess light being given off by numerous signs, houses, and buildings. Polluting light is often wasted light involving unnecessary energy costs and carbon dioxide emissions. Light pollution is described as artificial light that is excessive or intrudes where it is not wanted. Well-designed lighting sends light only where it is needed without scattering it elsewhere. Poorly designed lighting can also compromise safety. For example, glare creates safety issues around buildings by causing very sharp shadows, temporarily blinding passersby making them vulnerable to would-be assailants. The ecologic effects of artificial light have been documented. The World Health Organization in 2007  issued a report that noted the effects of bright light on flora and fauna, sea turtle hatchlings, frogs during mating season and the migratory patterns of birds. The American Medical Association in 2012 issued a warning that extended exposure to light at night increases the risk of some cancers. Two studies in Israel from 2008 have yielded some additional findings about a possible correlation between artificial light at night and certain cancers. The Illuminating Engineering Society of North America (IESNA), in conjunction with organizations like ANSI and ASHRAE, publishes guidelines, standards, and handbooks that allow categorization of the illumination needs of different built environments. Manufacturers of lighting equipment publish photometric data for their products, which defines the distribution of light released by a specific luminaire. This data is typically expressed in standardized form defined by the IESNA. Association de Concepteurs Eclairage (ACE) in France. ^ Williams, Ben (1999). "A History of Light and Lighting". Archived from the original on 25 January 2013. Retrieved 23 November 2012. ^ a b "The History of Light". Planet Money. Episode 534. NPR. April 25, 2014. Retrieved June 20, 2016. ^ a b c d Eric Jay Dolin (2007). Leviathan: The History of Whaling in America. W.W. Norton & Co. pp. 339–40. ^ James L. Kirtley (5 July 2011). Electric Power Principles: Sources, Conversion, Distribution and Use. John Wiley & Sons. pp. 11–. ISBN 978-1-119-95744-7. ^ Vito, Gennaro F.; Maahs, Jeffrey R. (2011). Criminology: Theory, Research, and Policy (revised ed.). Jones & Bartlett. p. 70. ISBN 9780763766658. ^ Felson, Marcus; Boba, Rachel L. (2009). Crime and Everyday Life. SAGE. p. 186. ISBN 9781483342658. ^ Street lighting, energy conservation and crime. United States Law Enforcement Assistance Administration, Emergency Energy Committee, U.S. Dept. of Justice. 1974. The public [has] a general feeling that street lights have a deterrent effect on street crimes. This effect is somewhat substantiated by research conducted by LEAA and by the fact that various communities which have installed improved street lighting in certain areas have reported reductions in the rate of street crime. ^ a b c Li, D; Cheung, K; Wong, S; Lam, T (2010). "An analysis of energy-efficient light fittings and lighting controls". Applied Energy. 87 (2): 558–567. doi:10.1016/j.apenergy.2009.07.002. ^ a b Kim, W; Han, H; Kim, J (2009). "The position index of a glare source at the borderline between comfort and discomfort (BCD) in the whole visual field". Building & Environment. 44 (5): 1017–1023. doi:10.1016/j.buildenv.2008.07.007. ^ a b Velds, M. (2002). "User acceptance studies to evaluate discomfort glare in daylit room". Solar Energy. 73 (2): 95–103. doi:10.1016/s0038-092x(02)00037-3. ^ Bernstein (2006). The New York Times Practical Guide to Practically Everything: The Essential Companion for Everyday Life. St. Martin's Press. p. 424. ISBN 978-0312353889. ^ "Types of indoor lighting". Lamps USA. Retrieved 6 June 2018. ^ Transportation, Department of; Administration, Federal Highway (November 2003). Manual on Uniform Traffic Control Devices: Inserts Only. Claitor's Law Books and Publishing. ISBN 9781579809294. ^ Draft Revised Environmental Impact Report for Scotts Valley High School--Glenwood Site. Denise Duffy & Associates. 1997. ^ Felber, Bill; Fimoff, Mark; Levin, Len; Mancuso, Peter (April 2013). Inventing Baseball: The 100 Greatest Games that Shaped the 19th Century. SABR, Inc. ISBN 9781933599427. ^ "Leading luminaries". Cabinet Maker. 5419: 21–22. 2004. ^ Khan N, Abas N. Comparative study of energy saving light sources. Renewable & Sustainable Energy Reviews [serial online]. ^ "How to power an ENERGY-EFFICIENT LIGHT". Machine Design. 80 (12): 51–53. 2008. ^ Israel, C; Bleeker, N (2008). "Sustainable Lighting Strategies". Electrical Wholesaling. 89 (9): 38–41. ^ W. Kim and Y. Koga, "Effect of local background luminance on discomfort glare, Building Environ 2004; 38, pp. ^ ASSIST recommends: Guide to Light and Color in Retail Merchandising. 2010. Volume 8, Issue 1. Available online at: "ASSIST recommends: Light Source Color for Retail Merchandising | ASSIST Program | Solid State Lighting | Programs | LRC". Archived from the original on 2011-07-18. Retrieved 2011-05-13. ^ ASSIST recommends: Recommendations for Specifying Color Properties of Light Sources for Retail Merchandising. 2010. Volume 8, Issue 2. Available online at: "ASSIST recommends: Light Source Color for Retail Merchandising | ASSIST Program | Solid State Lighting | Programs | LRC". Archived from the original on 2011-07-18. Retrieved 2011-05-13. ^ Rea, MS; Bierman, A; Figueiro, MG; Bullough, JD (2008). "A new approach to understanding the impact of circadian disruption on human health". J Circadian Rhythms. 6: 7. doi:10.1186/1740-3391-6-7. PMC 2430544. PMID 18510756. ^ Australian Greenhouse Office (May 2005). "Chapter 5: Assessing lighting savings". Working Energy Resource and Training Kit: Lighting. Archived from the original on 2007-04-15. Retrieved 2007-03-17. ^ "Illumination. - 1926.56". Regulations (Standards - 29 CFR). Occupational Safety and Health Administration, US Dept. of Labor. Archived from the original on 8 May 2009. ^ Bellido-Outeirino, Francisco J. (February 2012). "Building lighting automation through the integration of DALI with wireless sensor networks". IEEE Transactions on Consumer Electronics. 58 (1): 47–52. doi:10.1109/TCE.2012.6170054. ^ "Lighting control saves money and makes sense" (PDF). Daintree Networks. ^ Hung-Liang, C; Yung-Hsin, H (2010). "Design and Implementation of Dimmable Electronic Ballast for Fluorescent Lamps Based on Power-Dependent Lamp Model". IEEE Transactions on Plasma Science. 38 (7): 1644–1650. doi:10.1109/tps.2010.2048928. ^ Hanselaer P, Lootens C, Ryckaert W, Deconinck G, Rombauts P. Power density targets for efficient lighting of interior task areas. Lighting Research & Technology [serial online]. June 2007;39(2):171-182. Available from: Academic Search Premier, Ipswich, MA. ^ Ryckaert W, Lootens C, Geldof J, Hanselaer P. Criteria for energy efficient lighting in buildings. Energy & Buildings [serial online]. March 2010;42(3):341-347. Available from: Academic Search Premier, Ipswich, MA. ^ a b ULRICH R S. VIEW THROUGH A WINDOW MAY INFLUENCE RECOVERY FROM SURGERY. Science (Washington D C) [serial online]. 1984;224(4647):420-421. ^ Chaves, Julio (2015). Introduction to Nonimaging Optics, Second Edition. CRC Press. ISBN 978-1482206739. ^ DiLouie, Craig (2006). Advanced Lighting Controls: Energy Savings, Productivity, Technology and Applications. The Fairmont Press, Inc. ISBN 978-0-88173-510-9. ^ Figueiro, MG; Rea, MS (2010). "Lack of short-wavelength light during the school day delays dim light melatonin onset (DLMO) in middle school students". Neuro Endocrinology Letters. 31 (1): 92–6. PMC 3349218. PMID 20150866. ^ Figueiro, MG; Rea, MS; Bullough, JD (2006). "Does architectural lighting contribute to breast cancer?"". Journal of Carcinogenesis. 5 (1): 20. doi:10.1186/1477-3163-5-20. PMC 1557490. PMID 16901343. ^ Newsham G, Brand J, Donnelly C, Veitch J, Aries M, Charles K. Linking indoor environment conditions to job satisfaction: a field study. Building Research & Information [serial online]. March 2009;37(2):129-147. ^ Griffiths, Sarah (24 February 2014). "Need to make a difficult decision? Switch off the LIGHTS: People think more objectively when in darkness". Daily Mail. Retrieved 25 February 2014. ^ Mientka, Matthew (25 February 2014). "Ambient Lighting Affects Decision Making, Emotional Intensity". Medical Daily. Retrieved 25 February 2014. ^ Ellis, Marie (25 February 2014). "Room lighting affects decision making, study suggests". Medical News Today. Retrieved 25 February 2014. ^ Wood, Janice (25 February 2014). "Got an Important Decision to Make? Dim the Lights". Psych Central News. Retrieved 25 February 2014. ^ Gumbel, Peter (December 4, 2008). "Lighting: Bright Idea". Time. ^ a b Billings, Lee (June 10, 2016). "New Map Shows the Dark Side of Artificial Light at Night". Scientific American. Retrieved June 20, 2016. ^ "AMA Adopts Community Guidance to Reduce the Harmful Human and Environmental Effects of High Intensity Street Lighting". www.ama-assn.org. Retrieved 2016-06-20. ^ Claudio L. Switch On the Night. Environmental Health Perspectives [serial online]. January 2009;117(1):A28-A31. Available from: Academic Search Premier, Ipswich, MA. ^ Lynn A. See the Light. Parks & Recreation [serial online]. October 2010;45(10):81-82. Available from: Academic Search Premier, Ipswich, MA. ^ Chepesiuk, Ron (2009). "Missing the Dark: Health Effects of Light Pollution". Environ. Health Perspect. 117 (1): A20–A27. doi:10.1289/ehp.117-a20. PMC 2627884. PMID 19165374. ^ Carlisle, Camille M. (July 16, 2012). "AMA Addresses Light Pollution". Sky & Telescope. Retrieved June 20, 2016. ^ Kloog, Itai; Haim, Abraham; Stevens, Richard G.; Barchana, Micha; Portnov, Boris A. (2008). "Light at night co‐distributes with incident breast but not lung cancer in the female population of Israel". Chronobiology International: The Journal of Biological and Medical Rhythm Research. 25 (1): 65–81. doi:10.1080/07420520801921572. PMID 18293150. Lindsey, Jack L. (1991). Applied Illumination Engineering. Lilburn, Georgia: The Fairmont Press, Inc. ISBN 978-0-88173-060-9. Fetters, John L. (1997). The Handbook of Lighting Surveys & Audits. CRC Press. ISBN 978-0-8493-9972-5. Guo, Xin; Houser, Kevin W. (2004). "A review of colour rendering indices and their application to commercial light sources". Lighting Research and Technology. 36 (3): 183–199. doi:10.1191/1365782804li112oa. Wikimedia Commons has media related to Lighting. Look up Lighting in Wiktionary, the free dictionary. Wikisource has the text of the 1922 Encyclopædia Britannica article Illuminating Engineering.